Thank you again for you amazing web-site!" 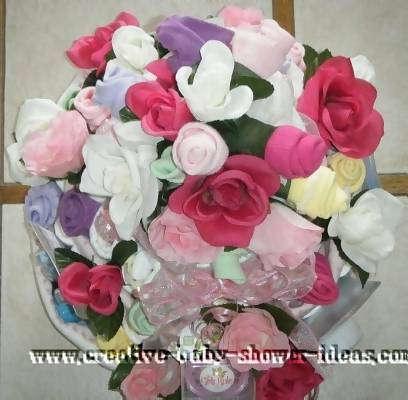 If you are looking for some great elegant diaper cakes, you have just found them! 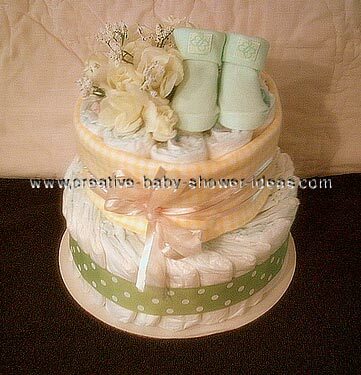 Take a peak at our reader gallery to get some great ideas for your own diaper cake. 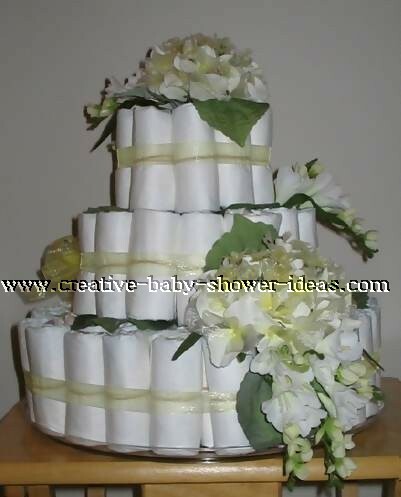 This elegant diaper cake was made with approximately 60 size 2 diapers. I started by rolling all of the diapers. They are held together by white elastics bands. The base of the cake is made of cardboard and covered in aluminum foil. It is 14" round. (These can be found at party supply stores.) In the center of the base I glued an empty paper towel roll to secure the diapers to. 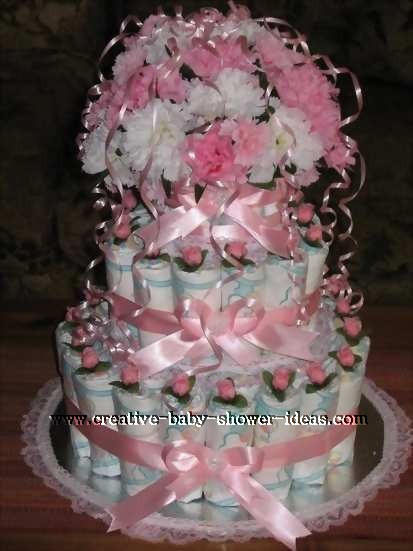 The bottom layer of the cake is made of 3 layers (rings) of diapers. Each one(ring) is secured with an elastic band. The middle layer has 2 layers(rings) of diapers around the paper towel roll and the top layer has one layer(ring) of diapers. To hide the elastics I used pink ribbon around the center of each layer. The same ribbon was used to make a bow and a small,white silk flower was put in the middle. 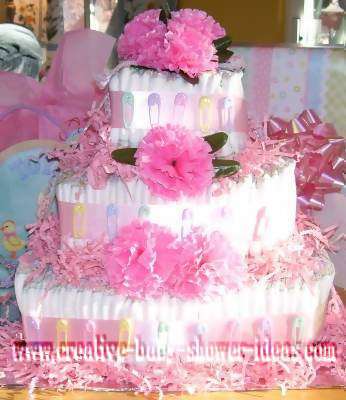 The base of the diaper cake is decorated with white and pink lace and is also on the middle and top layer. The bottom and middle layers have silk rosettes on the outside ring . There is one in each diaper. 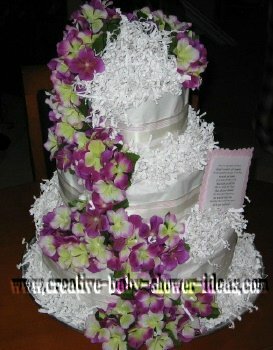 The top of the cake is decorated with pink and white silk carnations to add height to the cake. I finished off by adding some pink curling ribbon to hang down the sides. I started by taking infant diapers and rolling them up and holding them in place with rubber bands. 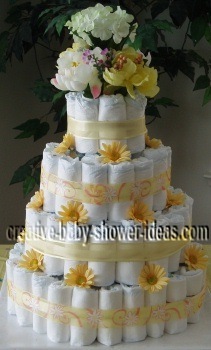 To make a large cake, I had somewhere near 100 diapers to roll and secure. Then I arranged them on a plastic serving dish (another gift for the mom) and held the circular round in place (very tricky with only 2 hands) with a color coordinating ribbon to cover the rubber bands. As I "tiered" the diapers, I stuffed goodies inside - like a present, making the outside look more elegant. Such items would include baby t-shirts, burp clothes, bibs, booties, blankies, baby powder, baby wash, etc. 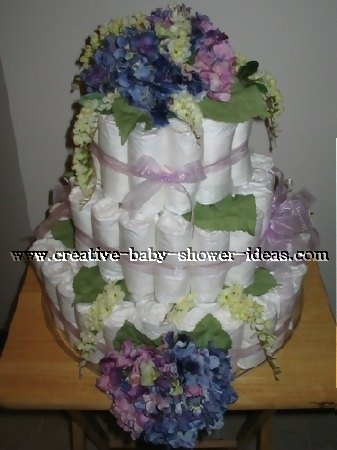 After the 3 tiers were assembled (just placing each layer right on top of the next) and "stuffed" I then decorated with color coordinating flowers and leaves (no needles, just stick the stems inbetween the diapers - yes they hold). I then wrapped the whole cake (as to prevent from mishaps) in clear cellophane and tie with a pretty bow at the top. And that's that! This cake was made for my sister in law. This is a 3 tier rolled cake. 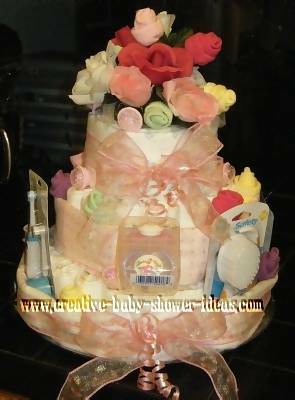 I used baby bottles inside the layers for support and hid cute baby items like lotions and onesies inside the diaper cake. I held each layer together with white curling ribbon. To finish it off, I used different shades of muted pink and burgundy silk flowers. 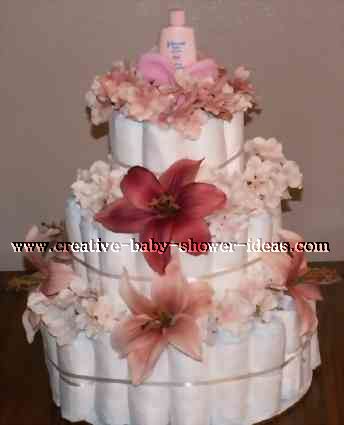 The top flower is placed in a 4 oz baby bottle filled with a baby washcloth. These were my first attempts at Diaper Cakes. I am hosting a baby shower for my best friend at our country club and I wanted them to be elegant and upscale looking! I can't believe how easy it was and how nicely they turned out. I used a styrofoam 'Frog" shaped like a column as the support piece for the first two layers. For the third layer I cut a paper towel roll in half, taped toothpicks to it, then pushed the toothpicks into the frog to secure the top layer. I used one box of 120 count pampers swaddlers size 2. 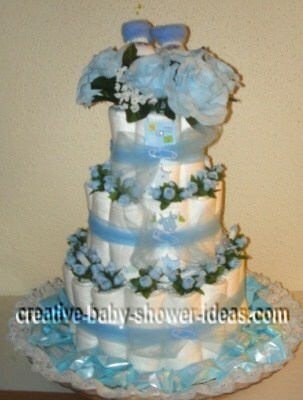 There are about 60 diapers in each cake. Thanks for the great instructions! Can't wait for the shower! As I "tiered" the diapers, I stuffed goodies inside - like a present, making the outside look more elegant. Such items would include baby t-shirts, burp clothes, bibs, booties, blankets, baby powder, baby wash, etc. 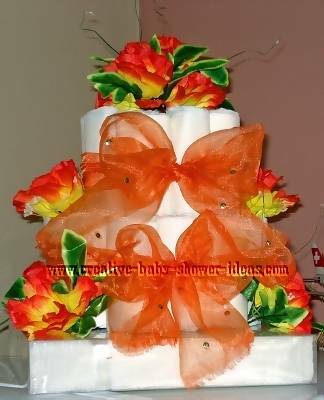 After the 3 tiers were assembled (just placing each layer right on top of the next) and "stuffed" I then decorated with color coordinating flowers and leaves (no needles, just stick the stems inbetween the diapers - yes they hold). This was my first attempt at an elegant diaper Cake. I am hosting a baby shower for my best friend at our country club and I wanted them to be elegant and upscale looking! I can't believe how easy it was and how nicely they turned out. I used a styrofoam 'Frog" shaped like a column as the support piece for the first two layers. For the third layer I cut a paper towel roll in half, taped toothpicks to it, then pushed the toothpicks into the frog to secure the top layer. I used one box of 120 count pampers swaddlers size 2. 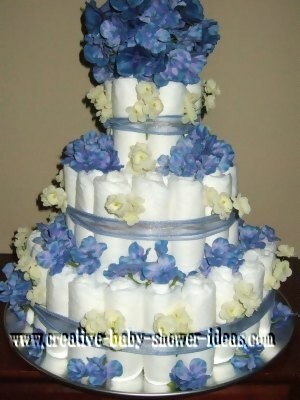 There are about 60 diapers in each cake. Thanks for the great instructions! Can't wait for the shower! I started with size three pampers (the ones with little design on them). I used baby shampoo for the center base. 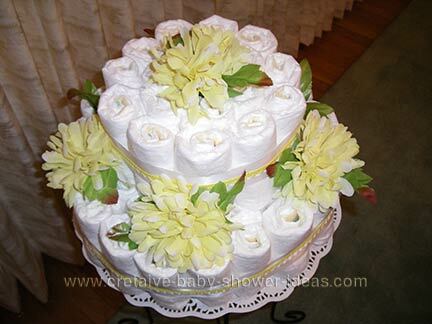 I rolled and wrapped each diaper with an elastic until I had enough rows to make a strong base of the cake. I then repeated for the next layer, but one row short. I then used a bottle of gripe water and a bottle of baby wash to heighten the center of the cake and then did the last layer. I then put little yellow booties at the top to hide the bottles inside. I then tied a real crystal pacifier right in the center of the booties. I found beautiful yellow and white ribbon to hide the elastics. The bottom tier ribbon had very nice crystal beads hanging down. 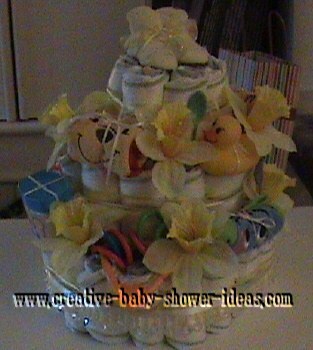 I then tied or tucked baby accessories throughout the cake and added yellow daffodil flowers at the end. All craft items were bought at Michaels and accessories at Walmart. 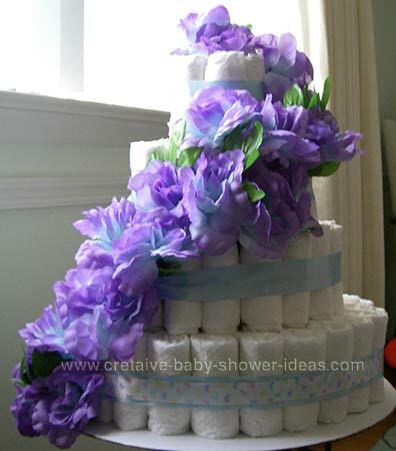 A diaper cake is very fun and rewarding. Yeah, my first diaper cake for my sister in law and it was so much fun! I accidentally bought diapers that had a print on them, and I felt that it was too busy to add the flowers I had bought. So instead, I wrapped each layer in white tissue to give me a clean slate to decorate. I added the ribbon, flowers, and then a poem. I made this diaper cake with 72 size 1 diapers, 1 baby blue fleece blanket in the middle, and 1 russ baby bootie bank on the top. I made this for a nurse friend of mine for a baby shower she was attending...it was a huge hit!! 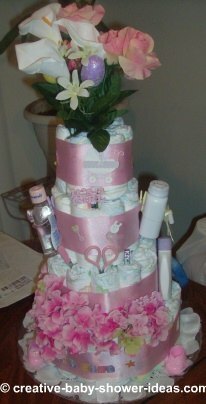 This was my first diaper cake and it went well. Everyone loved it. I needed a quick nice unique gift for a baby shower this weekend. I happen to be a cake decorator, but the mother-in-law was making the baby shower cake, so I figured I'd put my creative spin on this diaper cake I kept hearing about! 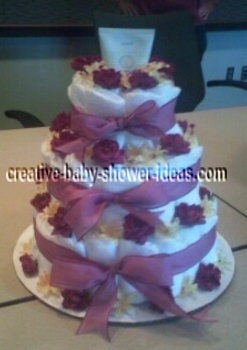 To make this diaper cake, I rolled up disposable diapers, held together with rubber bands. Then I put baby lotion in the middle and diaper cream in the top. Decorated with ribbon and fake flowers. From afar people thought it was a wedding cake... was very elegant and a nice present for the happy couple. I made this "cake" for my niece's baby shower to use on the gift table. This is my first attempt at diaper cake making! I love it and look forward to making more! This is my first diaper cake. I made it for my sister who loves footprints and flowers so I found a way to put them both on the cake. 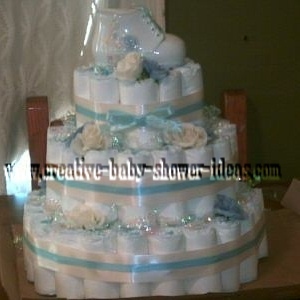 I have a diaper cake I made from your video instructions and also have some cute onesie baby shower invitations I did. 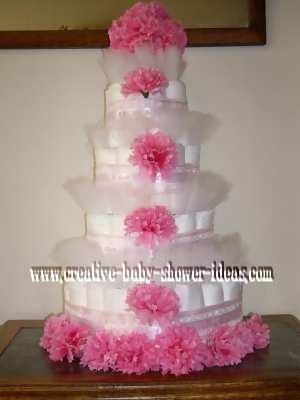 2 Tier Elegant layered and rolled baby cake...Design I made for a gift basket company In Halifax,Nova Scotia,Canada. This is my first real diaper cake. Some others I made were not so good but this one turned out great. It is 45 diapers size 1 and 1 bottle and 1 receiving blanket inside. I used 112 Swaddlers size 1 with 1 8oz and 1 4oz bottle. Each diaper was rolled. The only diapers with rubber bands are the very first row around the bottles. I then secured that with a rubber and placed each diaper with the open end against the last row placed. I continued this method until I had acheived my size cake. I then secured the ribbon around each layer tightly and removed the large rubber band. 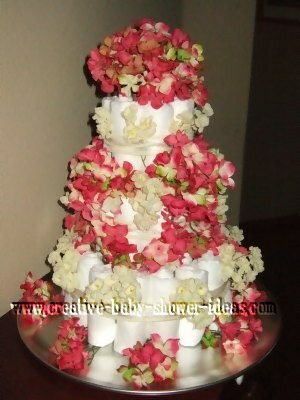 When complete I cascaded the flowers from top to bottom. I rolled 58 size two pampers swaddlers diapers with clear hair bands. Then put them around an 8 oz baby bottle with a rubber band. The middle layer is also like that. I placed the three tiers on a white cake stand. Wrapped pink ribbon around each tier and attached silk pink roses on the ribbon. 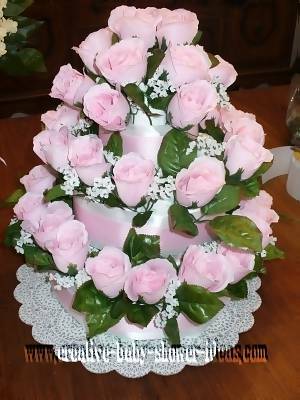 I also placed pink silk roses on the top tier in the baby bottle inside, it holds them like a vase. 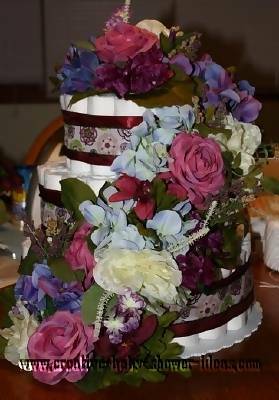 Lastly, I added white silk ribbon around the roses and had it flow down the sides of the cake. Hi! 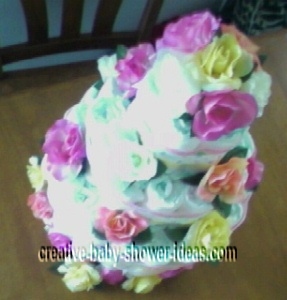 Here's the baby shower diaper cake centerpiece I made. It was fun getting it all together (a little bit of work - but totally worth it). 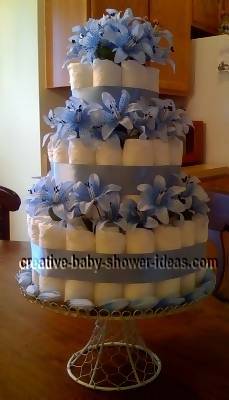 This is a 3-tier cake using almost a whole pack (78 Pampers Swaddlers #1) to get it complete. The top tier has 8, 2nd tier has 23 and the bottom tier has 41. I used smaller rubber bands to roll up the diapers and then larger (thin ones) to hold up the layers. This was my first attempt at getting one of these done and if given the opportunity, I would definitely do it again - lots of fun and pretty easy. 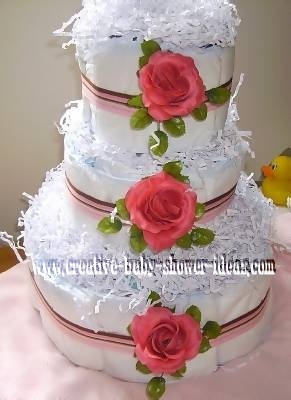 I have done 2 diaper cakes, and they get better and better! 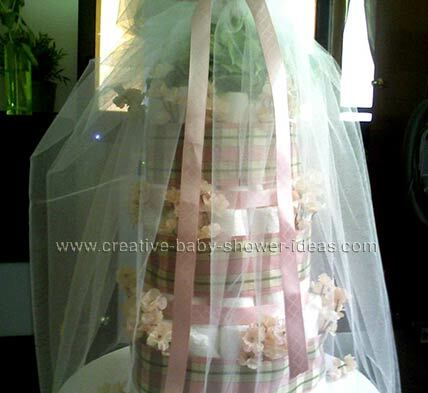 This pink and white cake was done with about 75 diapers (newborn size). 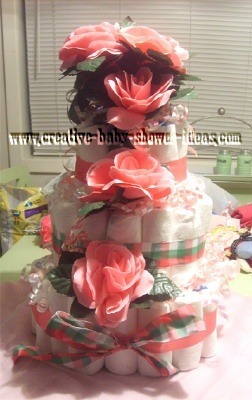 Here is my first diaper cake ever made. There are front views, side views and views from the top. thanks for looking. 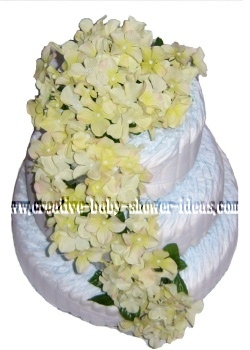 This is the first diaper cake I made with cascading flowers. I made this one for a girl at work who is having her third child, but her first girl. I wanted it to be very elegant and the colors match her theme in the baby's room. 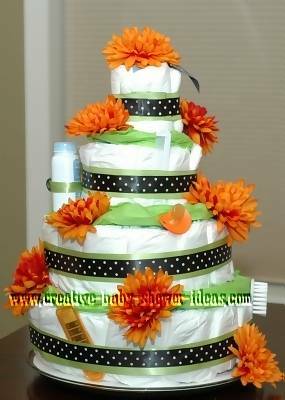 I loved your website and used a lot of the ideas mentioned to make this diaper cake for a shower I'm co-hosting this weekend. I couldn't find the crinkle cut paper to use as a border under each layer so I crinkled up tissue paper. I'm hoping to find some between now and then to change it out. This also helps hide the logos/coloring from the diapers that I didn't want to show. I noticed that huggies has a pale orange & green striped diaper out, that might have been a better choice for this theme. I used a whole package of size 1 diapers (50ct) and about half a package of NB (42ct). I rolled diapers individually using clear rubber bands for the centers then fanned out diapers to edge around and tied with ribbon. I bought the cardboard cake bases for each layer but then ended up only using one on the bottom (12in) and one under the 3rd layer (8in.) I found it too hard to hide the cardboard edge (the crinkle cut colored paper would help this). 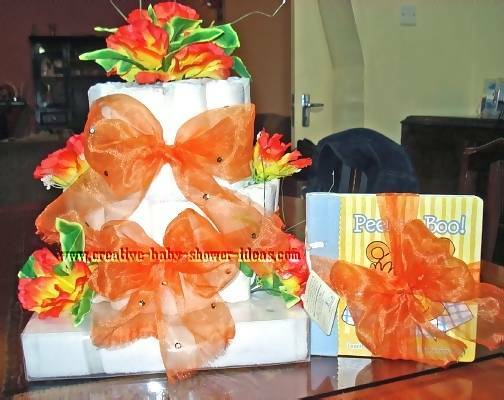 I bought 1 bunch of orange silk flowers and used wire cutters to cut a stem & flower to tuck into the diapers to hold them in place. Then bought a few little color coordinating items to tuck in here and there. Thanks for all your great suggestions! Hi guys! My name is Meghan! 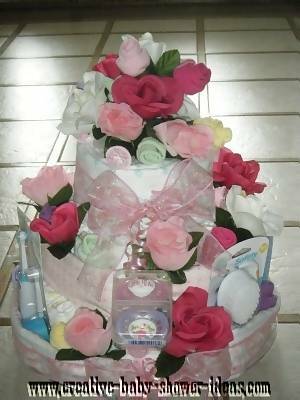 I am 19 years old and I made a diaper cake for my friend Sierra's baby girl Miley. I basically went to Ben Franklin crafts and found all of the cutest things I could find -- flowers, polka dot ribbons, everything "girly"! I honestly have NO idea how many diapers I used in my cake because I used a LOT. They were all held together by ribbon and safety pins. I used safety pins because they can be easily removed in case my friend wanted to use the diapers for her baby. I took the diapers and fastened them to three different layers of cardboard in which I bent to be in circle shapes to serve as the foundation for each layer of the cake. After each layer was put together, I stacked them on top of one another and used safety pins (once again) to fasten each layer to the other so that they wouldn't fall when the cake was being transported. 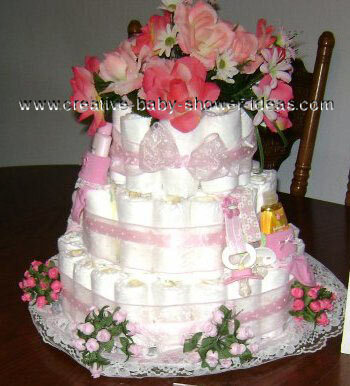 I spent about $40 on the cake with all of the diapers and miscellaneous items thrown in to make it look cute! This is one of the most enjoyable projects I have worked on! My friend thought it was soooo cute, and I told her to use the diapers but she didn't want to take it all apart! Once finished, this cake stood about 3 feet tall! Thanks for reading! Markina H. from Washington D.C.
Who did you make it for? The soon to be moms at the D.C. Birth Center. Was there a theme or style you followed?I used my own creativity. How many diapers did you use in your cake? There were 35 diapers in the cake. What were the ingredients? There were socks, flowers, lollipops, wash clothes, tulle, baby powder, baby shampoo an curly ribbon. How did you make it? 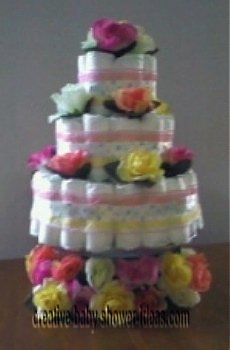 I made the cake with rolled baby size 2 diapers an a baby bottle in the middle. I decided to created this cake for the D.C. Birth Center because they are so loving and caring when it come to their patients. 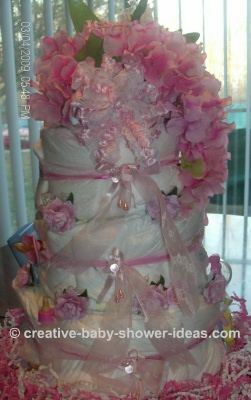 I really enjoyed having my 2 daughters under their care an would love to create a diaper cake as a way to give to the other moms who visit the center for their baby care an the prenatal classes. Who did you make it for? My Branch Manager. I made it for a baby shower. How many diapers did you use in your cake? There were 129 diapers in the cake. What were the ingredients? I used diapers, flowers, baby spoons, 8 ounce baby bottle, sippy cup, lotion, vaseline and wipes. How did you make it? I watched the tutorial on how to make a basic diaper cake, and then just added my own touch to it. 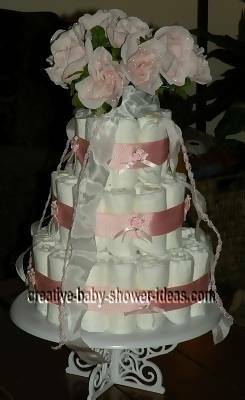 I had 21 extra diapers, so I made a little pyramid to put to the side of the diaper cake, added some ribbon, some bells to the top of it, and topped it off with a cute bow.